Tahini ice cream vegan, for someone who loves dairy as much as I do, it is a rather cruel irony that I am actually lactose intolerant. When it comes to ice, which should rightly be a happy occasion, it usually leads in the search for privacy and running water, and quickly. But I will spare you the damn details and I will not share what will happen next. 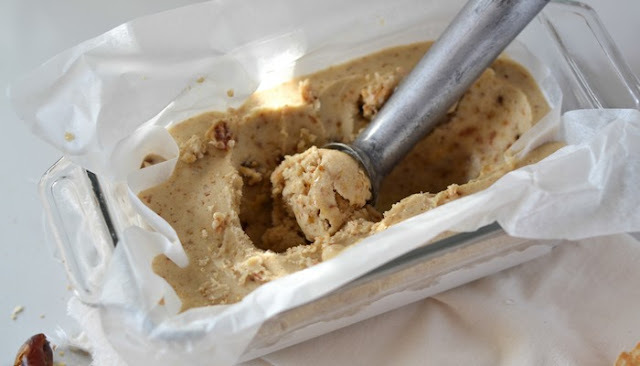 What I'm going to share is my recipe for vegan Tahini ice cream. This recipe consists of little more than frozen bananas and is also one of the most profitable because there are clearly no egg yolks, creams or refined flavors. Speaking of this, I have added a little bit of fantasy in the form of caramel sauce to serve hot and to make ice: you never recommend the secret ingredient. Put all ingredients in a blender (my NutriBullet works like an amulet) and press until combined. The mixture must be thick and creamy; You may need to refreeze the ice cream mixture before serving it. In a pan over low heat, immerse the dates in a little water and drain. Place in a food processor with coconut oil and vanilla. Lightning to flat and serve the "toffee" date together with the ice while it is still hot. 1. Scratch the pages every few minutes. 2. Fry the black sesame paste in a medium pan with 3 tablespoons of coconut cream. 3. Add the remaining coconut cream, coconut milk, sugar, maple syrup, coconut oil, vanilla pulp and pod and salt to the pot and heat over medium heat with occasional stirring. When the cream is simmering, remove the pan from the heat. Cover and allow to soak for 20 minutes. Remove the beanbag, scrape the inside of the pods for all the good vanilla. 4. Prepare an ice bath by filling a large container with ice cubes and water. 5. Pour the base into a large 1-gallon Ziploc bag. Close the mixture and place in the ice bath until it is cold for about 30 minutes. 6. Pour the ice base into the bowl of your frozen ice machine. Follow the instructions on your ice machine to beat the base in ice until it has the consistency of smooth operation, about 15-18 minutes. 7. Pour ¼ of the ice cream mixture into an oven dish. Put ¼ of the strawberry mixture on 4-5 places on the ice. Use the back of a spoon or toothpick to turn the strawberries lightly on the ice. Repeat this 3 times until you have used up all the ice cream and strawberry mixtures. 8. Cover the ice cream and freeze for at least 4 hours, preferably overnight. If you do not get this mix, you can replace it with roasted sesame seeds to get a sweeter Tahini version, or use all black sesame seeds (try them before you make the pasta, if you have not already!). It's not about baking or melting, and the end result is a frozen treat somewhere between a raw ball and an ice cream, perfect for summer! I decided to change the order of layers of chocolate and Tahini in the cups, but this is purely aesthetic and you can skip this step to save a bit of time. The preparation time says 2 hours, but that is mainly to humidify the data and freeze the cups: the real work is fairly quick and easy. The glasses will melt when they are stored at room temperature. Keep them in the freezer until you can enjoy them. I almost forgot to mention that they are refined without sugar and only sweetened with maple syrup and dates! 1. Place a small tin of muffins with baking tins. 2. Drain the data and place in a blender. Add the Tahini, coconut oil, maple syrup, vanilla extract and salt. 3. Put half of the mixture in a container and set aside. 4. Add the cocoa powder to the mixture in the blender and mix until smooth. 5. Put a little less than a tablespoon of the chocolate mixture on the bottom of half of the baking cups. Sprinkle a little grated coconut over the mixture and use your fingers to mix it. Add a little less than a tablespoon of Tahini mixture, press with your fingers and drizzle with grated coconut. 6. Repeat the process for the other half of the cups, this time with the Tahini layer at the bottom and the chocolate layer at the top. 7. Place the drawer in the freezer so that the glasses are placed in the cup (at least 1 hour). Keep the cups in the freezer until you can enjoy them. I'm afraid it might take a while to share this recipe because it looks like the sun is over after a few weeks of nice weather. But I am one of those people who can eat ice at any time of the year. It always seems the perfect and refreshing light after the dessert dinner. If you have not noticed it yet, many of my new recipes are based on Tahini. I cannot have enough of these things! And since my Tahini cheesecake with salted caramel was so successful, I still had to give a Tahini gift. I have something more on the way! These vegetables Tahini are so creamy, delicious and taste so good! Immersed in homemade chocolate and topped with chopped pistachios to make them even better. They are very difficult to resist! You only need a handful of ingredients to prepare: coconut milk, maple syrup (or other sweeter liquid), vanilla, a pinch of salt, and of course Tahini! You can always melt and use your favorite chocolate as a coating, and you can use any kind of chopped nuts or seeds to sprinkle over it. I love the crunch you get when you bite one of these pallets, so satisfying! I have many other simple and delicious Tahini recipes. Tahini is such a versatile ingredient that it offers many health benefits. See my 5 ways to use the Tahini video, where I show you how to integrate Tahini into delicious, healthy vegetarian and gluten-free vegetarian recipes. Vegan Tahini Caramel Ice Cream is exactly what your taste needs this summer. It is sweetened naturally, without dairy products, overloaded with delicious Tahinococcus gestmack and swirled with a sweet and sticky caramel. Prepare your cones! It is summer, it is hot and the ice is good. But no ice cream. Ice cream mixed with Tahini, naturally sweetened and stirred with these incredibly delicious candies. It is also with coconut milk, which is perfectly combined with Tahini and dates. And since they are summer desserts, look at those other favorites! Okay, this vegan Tahini Caramel Ice Cream is not the only amazing thing that has happened lately... because we buy a house in other news! I can hardly believe it! Sometimes I feel like I'm dreaming! Josh and I had been shopping seriously at home for the last six months. Due to the market situation, the houses are sold in less than 24 hours after they have been added to the list (AKA madness).